"Morale ain't gonna help us much if Fannin don't get here, and quick!" Much has been made about John Wayne's direction of The Alamo, his production of the film, his drive to make it and so on. There are pointed expressions of his surprise and disgruntlement at John Ford's arrival on the set and how Wayne put his old boss to work shooting some meaningless scenes. However, there is pointed moment in the documentary included here in which an actor notes that Ford directed his death scene. I have always been of the opinion that essentially John Ford directed this film without major credit as a payback to Wayne. Much is made about Wayne taking on so many roles and I have no doubt that in a certain reality, he did direct the picture. It just seems odd that a directing legend like Ford just happened to be hanging around and did some second unit work to just keep him busy. The politics of this movie are somewhat right wing, but not unpleasantly so— the political philosophy lies more in the view that things are black and white and there is an "us or them" quality that seems out of date. The siege at the Alamo has suffered from some revisionism as far as the motives of the Texicans in their fight for freedom from the oppression of Santa Ana. What can be said about John Wayne as Davy Crockett? This performance has serves to define Crockett in many peoples minds, despite the protestations of historians. There has been much revision in Alamo history that actually includes a different ending of the battle before the death of the men defending the fort. Here Davy Crockett is the figure that Texans and Americans would want at his most single-minded. This is John Wayne "Dukeness" at its most robust when he was one of the most popular stars in the world. 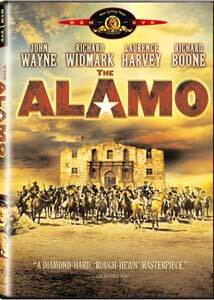 The documentary also makes it clear that Wayne had preferred to make The Alamo as a director and not star in it, although it seems that this would have been impossible. There is no doubt that Wayne set out to make a picture that was to win the Oscar as the best of the year. Legend has it that an embarrassing campaign by Chill Wills for the Supporting Actor statuette caused a backlash against the film. Richard Widmark seemed to consistently be miscast in more major films than any other actor. It is hard to accept him as Jim Bowie and one might wonder how he got so many action adventure roles, when he seems so unsuited. His acting is among the most stilted of any major star of the 1950s and '60s and it is at its worst here. Laurence Harvey, on the other hand, in his role asTravis has always been, in my mind, the quintessential "popinjay" portrayal of that determined officer. Frankie Avalon takes the character that is often in a John Wayne picture of the young actor or singer in an sidekick role. The part was filled by Rick Nelson in Rio Bravo, Patrick Wayne did the duty once or twice, James Caan was in the El Dorado, Dennis Hopper took a turn in The Sons of Katie Elder and Jan Michael Vincent was the boy was in The Undefeated. Ken Curtis (Capt. Almeron Dickinson) started as a singing cowboy and would later be feisty Festus Hagen, deputy to Matt Dillon on Gunsmoke, successfully for a decade. Chill Wills had been a character actor in mostly Western films for almost three decades before playing Beekeeper in The Alamo. He lost Best Supporting Actor to Peter Ustinov's Spartacus performance and many have said that his attempt to promote himself for the award was a personal embarrassment and also cast a pall over the much-nominated Alamo, which ended up winning only for Best Sound. The buildup to the battle is quite drawn out and amazingly little character is developed over that time. There is a narrowness of acting in this film that is reflective of many popular films of the era with characters that don't really grow and change, even over the course of two and a half hours. We never really learn, except in the most shallow terms, the why of these men hopelessly defending an outpost of rebellion against their legal government in Mexico. Little is provided of the Mexican side beyond cardboard stereotypical representation. Although impressively staged and the centerpiece of the film, the battle scene is surprisingly quick and superficial after the long build up we are forced to endure. The action seems almost quaint when viewed against the violent war films that have emerged in this post-Saving Private Ryan era. Not a great film by any stretch, but still entertaining for fans of John Wayne and/or period war dramas. Image Transfer Review: Good transfer featuring the original 2.35:1 anamorphic widescreen image, and rich color and detail made to work very will in the home theater. Audio Transfer Review: The Dolby Digital 5.1 audio transfer is merely serviceable as with many films of this era. A little echo in the surround speakers gives them a purpose and provides the illusions of a larger sonic experience than a typical TV airing. Also available in French stereo and Spanish mono. Extras Review: John Wayne's The Alamo Documentary (41m:32s): Interesting history of the making of the film from Wayne's first attempts to get a project underway to the aftermath of the Oscars. Decently mounted fluff piece that captures a lot of that era of moviemaking and the people who make them. A nice addition to DVD both as trivia and background to the film. A controversial film in its time, The Alamo is ultimately an epic of John Wayne's "Dukeness" as he essays American legend David Crockett in the futile defense of the Texas rebellion against Mexico at the Alamo mission in San Antonio. Laurence Harvey is excellent as Col. Travis and Richard Widmark is less so as Jim Bowie.